Congratulations! If you're reading this your probably contemplating trekking in Mongolia: one of the best ways to see this magnificent country. Generally, Mongolia is a difficult place to travel independently using public transport, but those hiking in Mongolia are free to do what they like. If you're on a budget, trekking is a far better way to experience Mongolia than spending your whole time waiting for crammed shared jeeps to take you from town to dilapidated town. It's far better to be out walking than sitting in these jeeps: most of the journeys are overnight and, while you might travel a lot further, you don't get to see much of Mongolia. 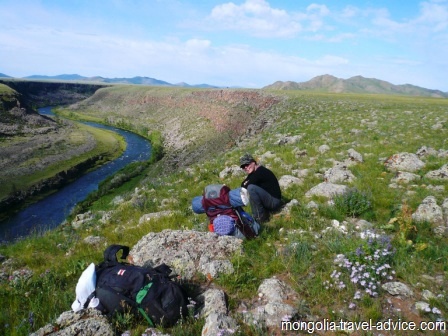 Hiking in Mongolia is not only for experienced folk (though there is plenty for expert hikers!) but beginners can plan journeys that are both safe and enjoyable, by following a lakeside, or plotting a route next to a river. Stunning West Mongolia is the best place to hike in Mongolia, period. It does cost a bit to get out there (flgihts at least $800 return in high season; or a 3-day bus ride), but it's well worth it. The West's Altai Mountains are a wonderland for hikers. Tavan Bogd national park spans most of them. 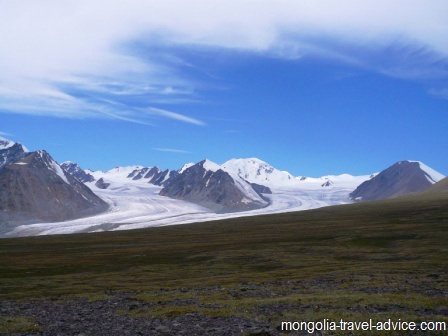 The Altai link above describes a great route up from Khoton Nuur, one of the prettiest lakes in Mongolia, and up to Khuiten Uul, the highest peak in Mongolia with a couple of glaciers either side. That's a world-class walk, yet you'll probably only bump into one or two other groups -even in peak season! For those who want to climb Khuiten Uul, you don't need to be overly experienced but you will need both mountaneering gear and a guide (mandatory for tourists climbing the peak, given it's proximity to China). Hovd tour offer great packages climbing up to the peaks. Use the form below to contact them and ask for a detailed itinerary and quote. They can, of course, organize a pack animal for you if you want one, and can customize your itinerary to suit you. 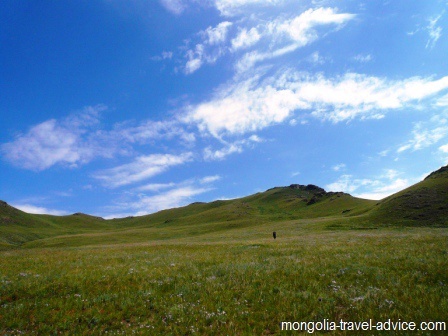 Mongolia trekking: feel like a little speck under the Big Blue Sky. Pictured are the wide, open valleys of Central Mongolia. To get a bit more off the beaten track out West, you can go to remote parts of the Altai mountains, or there are some spectacular snow-capped peaks which rise from the hot, dry lowlands of Uvs and Zavkhan provinces. This includes the holy Otgon Tenger Uul and the beautiful surrounding area to the Northwest. Kharkhiraa Uul and Turgen Uul also get good reviews. These parts are remote, so you either need to be experienced or go through a good tour company like Hovd tour to ensure you have a quality guide. 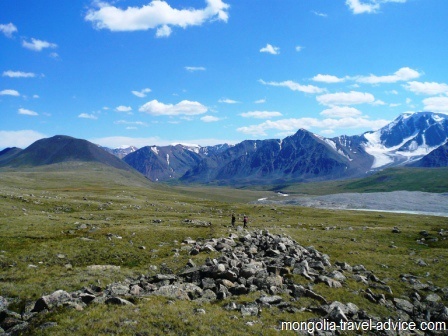 Below I've listed other good places to go Mongolia trekking. These places include a bit of geographic variation and cover some of the more scenic parts of Mongolia. There are no fences or private property in Mongolia, so if you have a mind to you can go hiking wherever you like!However, trekking in the mountains is usually preferred, as they're prettier, cooler during the hot summer months, and involve more variation. You can go across the open steppe, but it can be a day's walk between valleys! Read my page on Mountains in Mongolia to learn about the Altai, Khangai, and Khenti ranges, or at least click on this map and get a high level overview. Closer to Ulan Bator, Terelj national park is thickly wooded and has some seriously steep backcountry. There are bears around, too. Day walks are easy, but only experienced hikers or those on a guided tour should go into the back country. Just south of Ulan Bator, just beyond Zaisan memorial, is Bogd Khan Uul strictly protected area. The area is pretty much a circular shape starting south of Zaisan, and is ringed by a road -so as long as you can keep heading in a constant direction, you can find your way out of there on a 2-3 day hike. Bogd Khan doesn't have the most spectacular countryside, but it's pretty darn good, and it's amazing that such a beautiful and remote place lies right next to the nation's capital. Lake Khovsgol is a beautiful place and includes great hiking. It's hard to get lost when following the lake shore, but if you don't loop back inland you'll have to follow the same way back. The Egiin Gol, which flows out of Hovsgol at Khatgal, is loaded with Taimen and perfect for a Mongolia trekking/fishing combo trip. Central Mongolia's Khangai moutains offer more gentle, rolling hills to hike through. Terkiin Tsaagan Nuur (white lake) west of Tsetserleg is a popular hiking spot, and to avoid the crowds you can follow the nearby Tsuman Gol (which feeds the lake) back west through some beautiful canyon country. Note that except for the more mountainous areas to the Southwest of the Khangai range, the valleys are much broader and wider, and it can be a couple of hours walk before the views change.. Some might like that, some might not; personally, I quite enjoy hiking through there. Me! Having fun hiking in Mongolia. 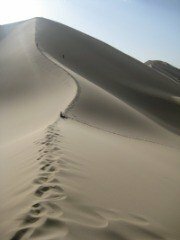 For those who like the idea of walking on the open steppe, but the thought of cramped hiking tents, thin matresses, tiny stoves, and dehydrated food is a bit unnappealing, then the option is there to arrange a pack animal. A horse or camel will cost you about $40-50US a day (including local wrangler). That way you can enjoy yourself strolling freely along bearing just a day pack, while you support the local community by engaging a local nomad to show the you the way and lead a best of burden carrying all your (heavy) luxury goods, like a big tent, changes of clothes, pots, pans, food... and even beer! Purist hikers probably wouldn't dream of taking a pack animal to carry their burden when trekking in Mongolia (it's a pride thing, I guess), but it's a popular option for beginners or people who just want to enjoy the great outdoors in comfort. Why not?! Pack horses allow you to carry way more stuff. This photo of Mongolia trekking in early May, which was still pretty darn cold! 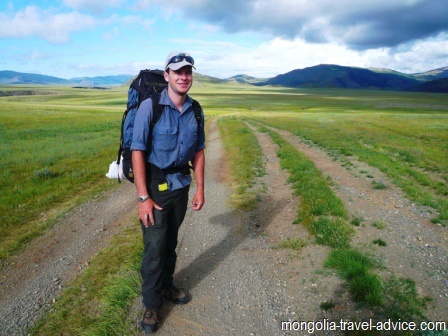 What to pack for Mongolia hiking? Well, first thing you need to do is view my packing list. If you're hiking in Mongolia independently, then obviously you'll need to cut down on volume and weight as much as possible, and take the smallest possible tents, mats, stoves, etc. Also bring some hydrated food from home (it's only available in UB, and is expensive). 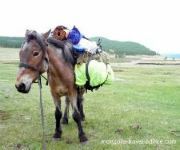 If you decide to use a pack animal when Mongolia trekking, you can probably take whatever stuff you like, as you won't be the one carrying it up the mountainside. (NB: your airline probably won't allow you to pack a horse or camel in your checked luggage without imposing excess weight fees: you'd best arrange one once you're on the ground in Mongolia!). 1: Read my pages on places in Mongolia, or check out my photo gallery, to get an idea of where you want to go. (The West is the Best!). 2: Read all about the best ways to get to Mongolia from your home country. 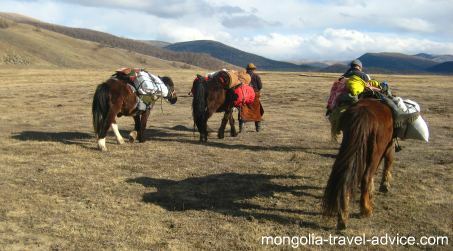 3: Make sure you pack the right stuff when Mongolia trekking. 4: Consider whether or not to go on a guided tour. Even experienced hikers will probably have to use a tour company at some point to arrange a private vehicle (if not a guide or pack animal), as public transport goes between towns, and public transport to national parks is limited. I continually recommend Hovd tour on my site because they're the best all-round value. Use the form below to tell them what you want to do, and request a detailed itinerary. Mongolia trekking: Hiking near the Tsuman Gol canyon, near Terkhiin Tsaagan Nuur (White Lake) near Tsetserleg.